Winter is no time for hibernation in the Arts Department. 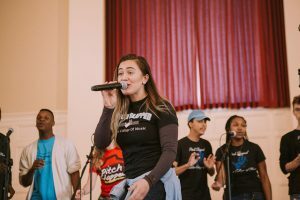 Students are busy rehearsing, creating, and learning new techniques, and a raft of performances and exhibits will give them a showcase for their talent and hard work. Speaking of talent and hard work, Mark Wei ’17 received the Williston Working Artist Award, bestowed to those who go above and beyond in effort and achievement in the arts. This fall, Mark returned to campus after a summer internship at a Beijing studio determined to become a photographer. “It’s obvious that Mark has found his passion,” said photography teacher Ed Hing ’77. “He spends most of his waking hours in the Photo Lab thinking, creating, and making images. He aims for perfection in pursuit of his vision. The results have been exceptional and inspiring.” Congratulations, Mark! On the heels of a daylong visit from Berklee College of Music student a cappella singers Pitch Slapped (read more here), Williston welcomed pianist Aaron Diehl. Diehl is one of the most sought after jazz virtuosos, consistently playing with what the New York Times describes as “melodic precision, harmonic erudition, and elegant restraint.” Diehl’s meticulously thought-out performances, collaborations, and compositions are a leading force in today’s generation of jazz contemporaries, spearheading a distinct union of traditional and fresh artistry. 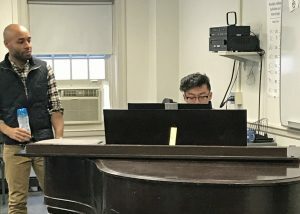 He was on campus to deliver a master class to Mario Flores’ instrumental students before his performance at the UMass Fine Arts Center with Grammy-winning vocalist Cécile McLorin Salvant and fellow pianist Adam Birnbaum, playing songs by Jelly Roll Morton and George Gershwin. Read more about his visit here. But there is still more to look forward to! 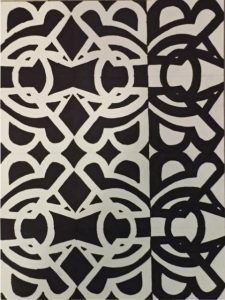 Artist Bill Mead is showing paintings through the end of February in the Grubbs Gallery. Winter Choral Coffee House on February 16 will feature singers from Williston’s many choral groups at 7:30 in the Chapel. Williston’s dancers will perform their winter moves during a show on February 27 at 4:30 p.m..
Winter Pops Concert, February 26, 7 p.m. in the Dodge Room of the Reed Campus Center (moved from the chapel at 7:30 p.m.). Dance Concert, February 27 at 4:30 p.m. in the chapel. Aaron Diehl listens while Derrick Zhao ’18 plays. Mario Flores’s instrumental students got a treat yesterday when acclaimed pianist Aaron Diehl stopped by campus and delivered an impromptu master class. “It was a fantastic opportunity for our students!” said Flores, who leads the Williston’s orchestral and jazz programs and teaches music here. Diehl is a sought-after jazz virtuoso, playing with what the New York Times describes as “melodic precision, harmonic erudition, and elegant restraint.” He will perform tonight at the UMass Fine Arts Center with Grammy-winning vocalist Cécile McLorin Salvant and fellow pianist Adam Birnbaum, playing songs by Jelly Roll Morton and George Gershwin. “We had four students play and work with him,” Flores said. Students brought a piano piece they were working on, either already learned or just beginning to master. Diehl listened and then provided feedback and suggestions about everything from expression of emotion to concrete advice about fingerings and hand position. “It was a casual but professional learning moment for our kids,” Flores said. Williston recently presented our second iteration of the Grum Project, which brings multi-disciplinary artists to campus, and is funded by a generous alumna. Pitch Slapped, a co-ed a cappella group based at Berklee College of Music in Boston, performed at assembly and lead workshops with singers in the Middle School and Upper School on Feb. 10. See photos of the visit here. Gabby Record ’17 belts out a song at the Winter Choral Concert. At a recent assembly, Visual and Performing Arts Department Head Natania Hume presented this year’s third Williston Working Artist Award to Gabby Record ’17. 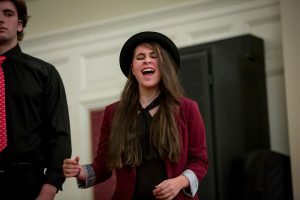 Visual and Performing Arts Teacher Steven Berlanga, who leads choral music at Williston, said this about Gabby in nominating her: “Obviously she is a good musician and singer, which she is able to demonstrate at concerts and in rehearsal. 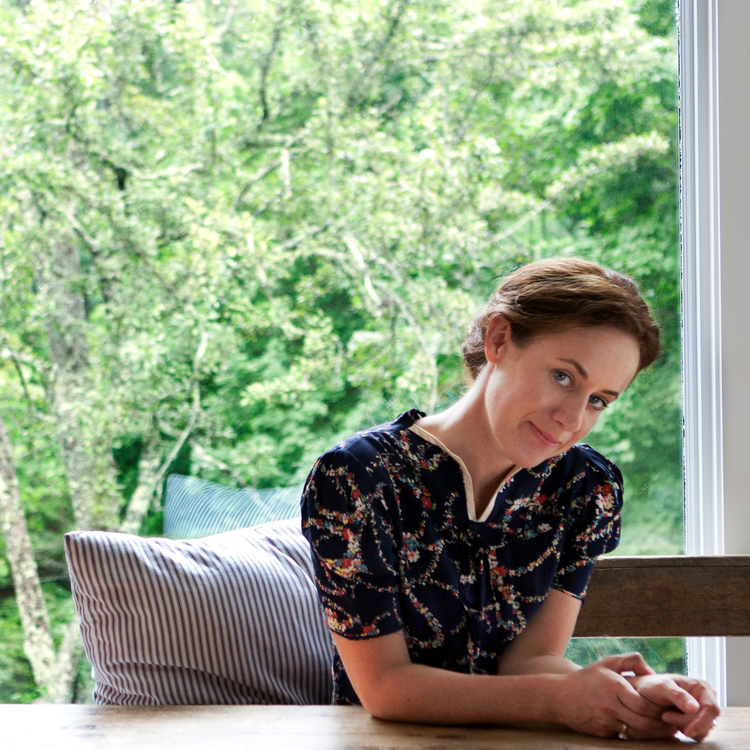 Melissa Groo will be on campus on January 19. 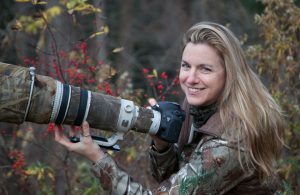 Award-winning wildlife photographer, writer, and conservationist Melissa Groo on January 19 will kick off Williston’s 2017 Photographers’ Lecture Series, which brings notable photographers to the Williston campus for a public lecture and in-depth classroom instruction for Williston students. 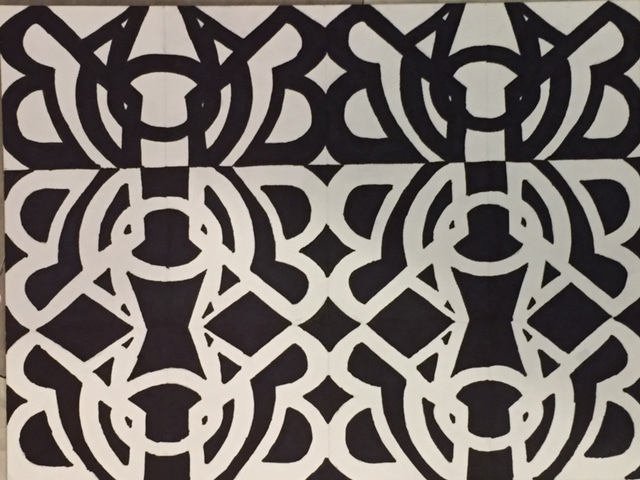 Students are creating compelling abstract black and white compositions. Question: In this interstitial season when the fall play and concerts are complete and spring shows are a long way off, what’s going on in the the arts at Williston? Answer: The arts are bustling in this “off” season! Visual and Performing Arts Department Head Natania Hume notes that there is a buzz of activity right now in the arts. Documentary photo students recently took a field trip to MAP Gallery to meet with photographer Tracey Eller. The Caterwaulers, Williston’s male concert chorus, now has a critical mass of 30 voices and with all those basses can hit the low notes (the New Grove Dictionary of Opera defines the bass range as the E below middle C to the E above middle C). Winter dance revs up with student choreographers creating compelling and relevant work, including one celebrating the legacy of Black dancers and choreographers. And visual artists are hard at work starting with compositions in black and white. The Caterwaulers are ready to sing low. I mentioned collaboration in my last post. This is, truly, one of my favorite parts about being a theatre person. Tech Week for The Comedy of Errors began on Saturday and the power of collaboration was on full display.